The drama, written by Marco Ramirez, opens Friday on the Hippodrome’s mainstage. 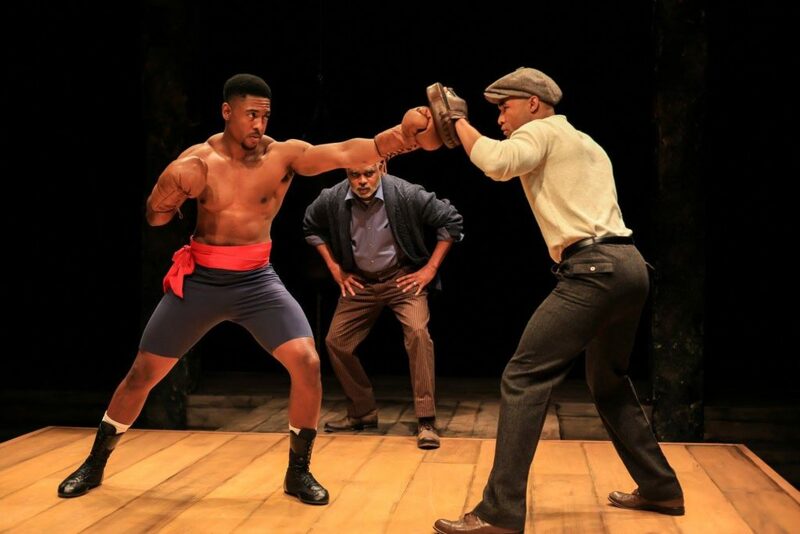 The play’s unique rapid-fire structure will, much like the boxers onstage, keep audiences on their toes. From the moment the sharp clapping, foot stomping and barking begin in the opening scene of The Royale, audiences are in for an electrifying theater experience. Just sit back, relax and prepare yourself for a pulsating, 70-minute adrenaline rush that might just leave you breathless! 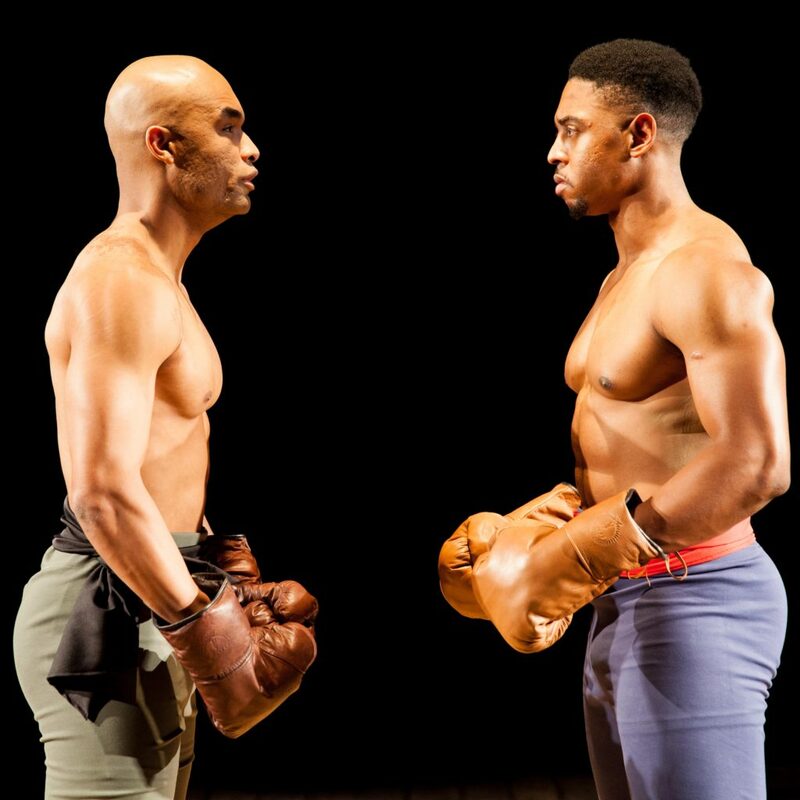 The Hippodrome Theatre’s newest production, opening this week, is a hard-hitting one-act play loosely based on the life of Jack Johnson, the world’s first black world heavyweight boxing champion. The backdrop is the Jim Crow era, with racial tension bubbling under the surface and a man’s dignity, pride and very existence at stake. There are discounted preview performances for The Royale on Wednesday and Thursday at 7 p.m. followed by Opening Night Friday at 8. There are also two shows each on Saturday and Sunday and eight performances a week to follow through Feb. 11. Ryan George, a Hippodrome Acting Company member who is co-directing and starring in The Royale, said he understands some theatergoers’ reluctance about attending a sports-themed play. Although it’s not a musical, The Royale borrows stage energy and sensibility from Hamilton along with the cadence and rhythm of, say, Def Poetry Jam. The fight scenes are less about exchanging punches and more about choreography, with boxers facing the audience rather than each other. For the squeamish, there’s no violence — no Rocky or Raging Bull moments — except for what the audience imagines. The stylized play was deftly written by Miami native Marco Ramirez, whose credits also include the TV series Orange is the New Black, Sons of Anarchy and Daredevil. The Royale begins with a dramatic fight scene and only builds momentum from there as the audience learns more about the boxer’s hidden secrets and potential Achilles’ heel. Lauren Warhol Caldwell, the Hippodrome’s artistic director who co-directed the play with George, fell in love with the script from the start because of its expressionism. 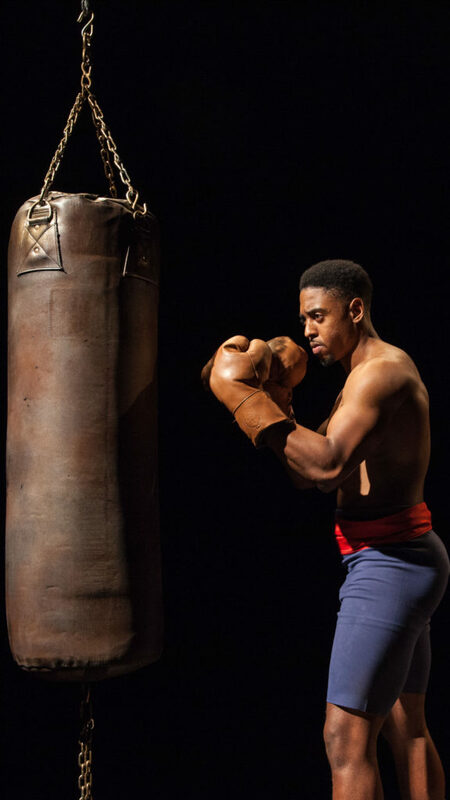 In the Hipp’s mainstage production, Bryce Michael Wood plays the fictionalized Jack Johnson character, a trash-talking fighter known in the play as Jay “The Sport” Jackson. Wood said he likes the layered, rhythmic structure Ramirez has created to keep The Royale moving at a rapid clip. 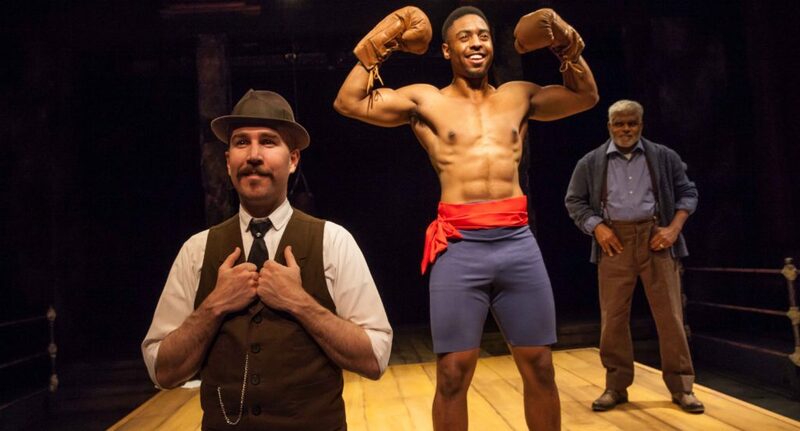 The well-toned Wood, a former hurdler for Notre Dame’s track and field team, has the physical attributes to pull off the role of a prizefighter, but he has never portrayed an athlete on a theater stage — until now. 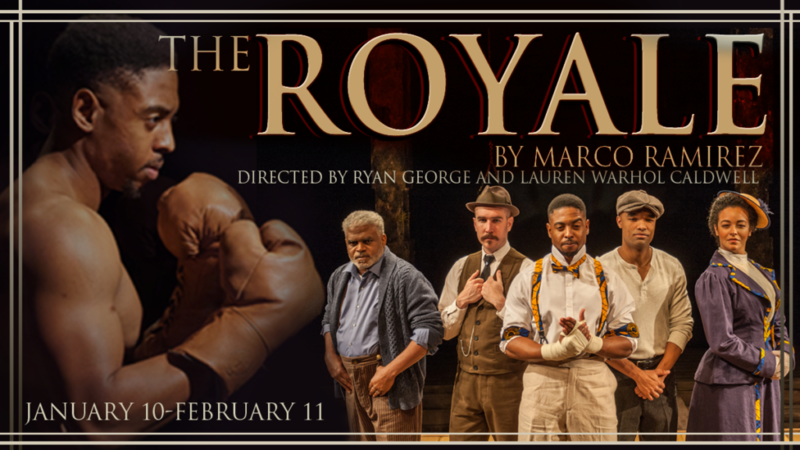 The Royale also stars Hippodrome newcomers Renata Eastlick as Jackson’s fierce sister Nina, Dylan Kammerer as excitable fight manager/promoter Max, and E. Stanley Richardson as Wynton, Jackson’s loyal trainer. George, meanwhile, plays Jackson’s opponent-turned-sparring partner, Fish. George has performed most recently at the Hippodrome in 2017’s Hand to God and in 2016’s Vanya and Sonia and Masha and Spike. Richardson is the only other actor in the show already familiar to Gainesville audiences. He has performed in local productions of Akeelah and the Bee, Cat on a Hot Tin Roof and Fences. All were directed by his wife, Carol Velasques Richardson. Richardson added that The Royale, with its rapid pace and pinpoint timing, is unlike any production he has done. George also performed as Fish when the GableStage theater company of Miami performed The Royale last year. For the Hippodrome version, George brought in Rudi Goblen, a South Florida performing artist responsible for the impressively precise rhythm and movement of the GableStage production. The Royale is built on momentum, George said. Eastlick, a native of Brazil who now lives in South Florida, said The Royale is “very much an ensemble piece” in which the contributions of each actor are critical to the whole. Her Nina character gives the production much of its heart and soul. “Anyone who watches this show will have different theories about this character, so I don’t want to say too much,” Eastlick said. Kammerer, a UF grad who now lives in Brooklyn, said that any good ensemble piece “lives and dies by the heartbeat that is one.” Such is the case with The Royale. The play is set in the early 20th century, but more than 100 years later, issues regarding race continue to make headlines. Wood said, if nothing else, The Royale will certainly open a dialogue about race. The Royale is geared toward those who don’t usually attend traditional theater, Kammerer added. Eight performances a week through Feb. 11. To purchase tickets and for further info, visit the Hipp website. Follow the The Hippodrome on Facebook. * Please let us know what you think of the production. Leave a Reply below! Quite a compliment from an esteemed member of the Hippodrome Acting Company. Thanks, Sara, for the bonus info regarding Dylan.